Swiss graphic designer Ralph Schraivogel is known for his astonishing posters for cultural institutions, each one resulting from intensive visual exploration. Schraivogel creates surfaces that boil and undulate with strange energy—in Cinema Afrika (2006), swirling contour lines give rise to colliding texts. 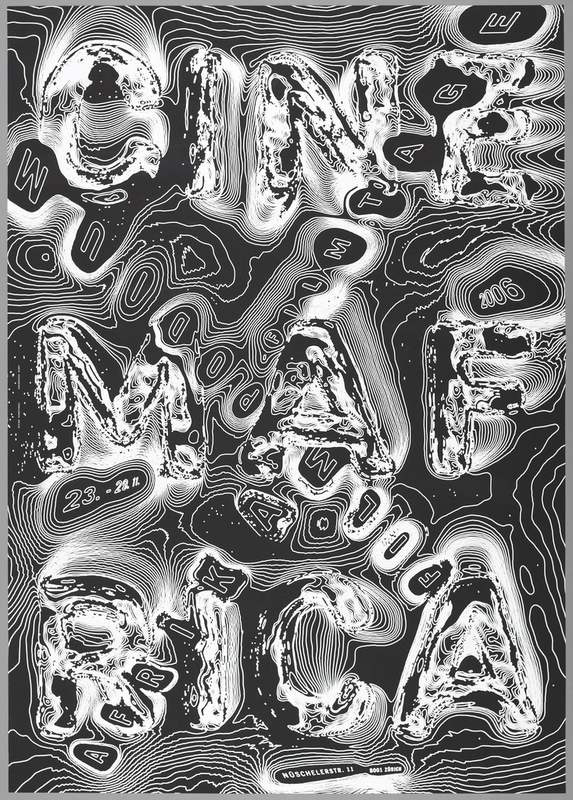 from the words “Cinema Afrika” resemble topographic lines on a map. Poster, Schule für Gestaltung Bern [School of Design Bern], 1998. Designed by Ralph Schraivogel. Screenprint. Printed by Sérigraphie Uldry AG (Hinterkappelen, Switzerland). 100 × 70.6 cm (39 3/8 × 27 13/16 in.). Gift of Ralph Schraivogel, 2007-15-1. In his poster for Schule für Gestaltung Bern [School of Design Bern], concentric lines engulf an edgeless, borderless landscape, leaving planes and boundaries uncertain. Flat patterns of ribbons and dots become a boiling landscape whose deformed surfaces suggest both motion and depth. Poster, Design Centrum Ceské Republiky [Design Center Czech Republic], 2002. Designed by Ralph Schraivogel. Screenprint. 84.6 × 60 cm (33 5/16 × 23 5/8 in.). Gift of Ralph Schraivogel, 2007-15-2. For Design Centrum Ceské Republiky [Design Center Czech Republic], Schraivogle’s warped typography creates the illusion of three dimensions as the text winds its way through a strange tangle of tubular forms. With just three colors, he has achieved a remarkable range of material effects, from weightlessness to dense, solid opacity.